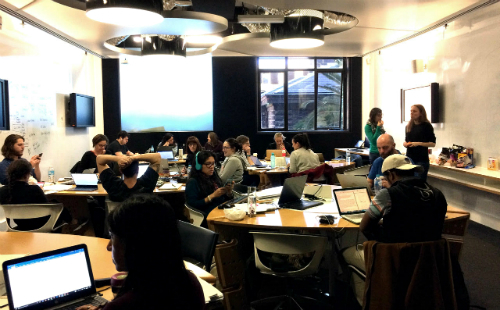 The first #MelbWriteUp sessions were more focused on providing a structure for the group by using the pomodoro technique. In a lot of ways, that was enough and has continued to be the backbone of the events. But other great things have evolved out of the events over time. One of these is that the events attract early career researchers and PhD candidates, as well as creative writers. Having researchers from various stages of their career and diverse areas makes for a rich and interesting crowd each month. Participants aren’t all from one institution, either. The community that has formed is made up of people from many institutions, including every Melbourne university. This is a good thing because it speaks volumes about the openness of those who attend, and demonstrates that research communities don’t need to be bounded institutionally. Indeed, they’re much better off for not being so. The other positive thing that has developed over the last year and a half is that the group has naturally formed into a community of support. Those five-minute breaks between pomodoros are like pressure valves being released, and it’s a great thing to know that those around you have the same challenges and struggles. Often, the small nuggets of advice that are exchanged in these breaks can be real life-savers. On a personal level, the experience of being a part-time PhD candidate has been really isolating at times. Due to time and geographical limitations, I don’t fit within a school, lab or department community, and have very limited time to meet other candidates due to working full-time. However, the moments spent with the #MelbWriteUp group once a month have been extremely important to me. I’ve made some really great friends and those who have come along have been so generous and open with their advice that it has become a crucial way for me to connect with other researchers. I’m hopeful that others who attend feel the same. When I look around, it seems that special bonds have formed across the group and it’s really nice to be a part of that. The final positive development that I’ll flag in this post is the formation of a regular group in regional Victoria. Two of the regular members of #MelbWriteUp, who have often travelled all the way down from Castlemaine to attend, decided to put together their own group. I’ve attended one of the sessions and it was amazing to see that writers and researchers had come from across that region to attend. There was a fantastic atmosphere in the room, and it provided a vehicle to experience a regional town in a new way. If you’re interested in this event, contact Dr Julie Rudner (J.Rudner@latrobe.edu.au / Twitter: @JulieRudner) to be added to the Castlemaine Write Up mailing list. It hasn’t always been plain sailing, though, as we’ve needed to work as a group to secure spaces for this series of events. This has taken some time and effort to figure out, and continues to be a challenge. I have always wanted to keep the sessions cost-free, centrally located, accessible and in a nice environment – a fairly tall order, really, when there is no money involved! Maintaining a community also takes some effort as people tend to come and go, based on their own changing situations. A careful balance is required to keep past members in the loop, but also to introduce new people to the event. Finally, and some people might find this surprising, I’m a painfully shy and introverted person who would much rather just sit in the corner and say nothing! But the value of this group and community forces me to step outside of myself. This is tough sometimes but I’m incredibly grateful for the support and kindness of everyone who is on this journey with me. #MelbWriteUp has been a very positive experience overall that has grown its own collegial community. While I don’t want to jinx myself, I am getting closer to completing my thesis. This writing community reminds me of the shared experiences of research and writing, and helps me get lots of work done. I hope we can continue the event well into the future. If you’re interested, you can subscribe to #MelbWriteUp alerts. It’s so good to hear another full-time worker getting there. With family commitments as well it is hard to achieve. I have a fortnightly shut-up-and-write 1 hour session I can attend. The rest is done at the weekend. I think I might enquire if anyone else is interested in a monthly all-day session during a weekend day. Thanks for sharing your story. Thanks very much for your kind comment. Hope that you’re about to get your weekend sessions going and all the best with the work. Cheers, Jason.